When her search for the scene of a perfect childhood day takes her up into the surrounding hills, Gemma is forced into a meeting with the legendary Cowgirl. Everyone at school knows she’s a weirdo: six foot tall and angry, the only conversations she has are with the twelve cows on her dad’s farm. But with her abrupt arrival in Gemma’s life, everything starts to look different. And with her only friends in mortal danger of the abbatoir, it turns out she and Gemma have a mission on their hands. A gently funny story of a community coming together, this is a tale of happy endings in unexpected places. I thoroughly enjoyed Cow girl. 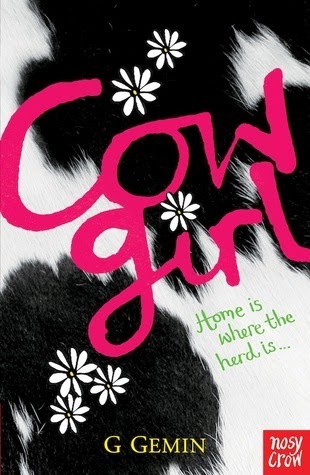 Cow girl is the story of a farm in decline the the lengths a young girl goes to in order to save her herd. It is thoughtful and poignantly. I loved that the book focuses on the relationship between a young teenager and her grandmother as it's not something I've seen lot of late and I loved that the book challenges the often wrong impressions we make of people we don't know. Also really lovely to see a British book not set in England.